Mummy LOVES gemstones (or crystals as she knows them) and has worked with them for years. 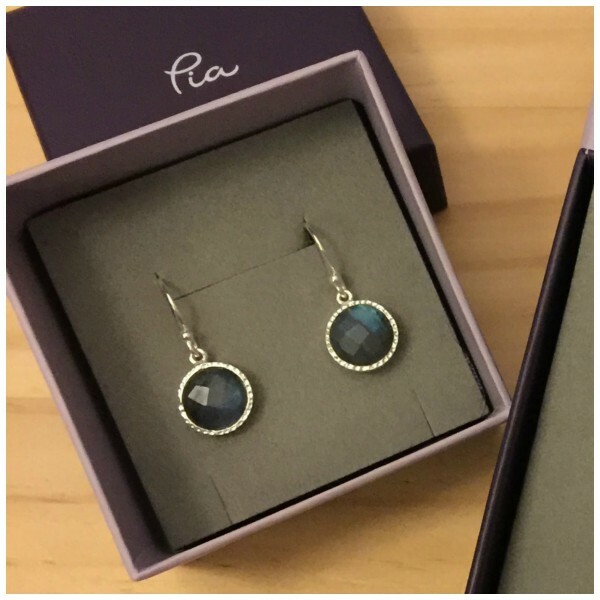 She especially loves them in beautiful jewellery so was thrilled to be sent a stunning Labradorite earring and pendant set for Mother’s Day. 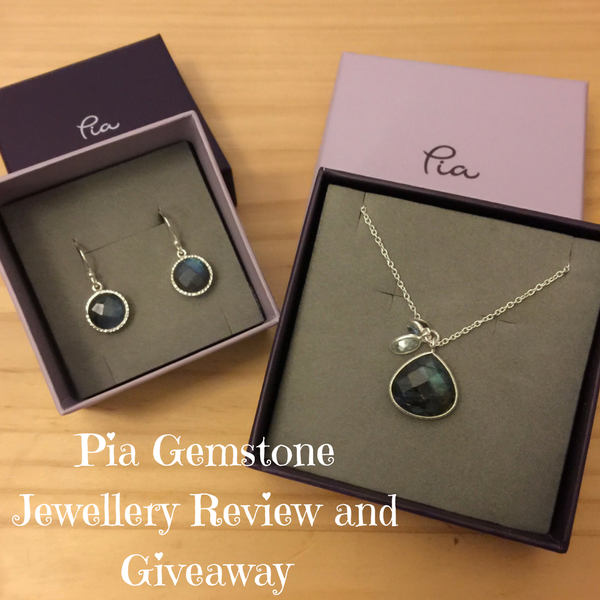 We are very excited to share our Pia gemstone jewellery review and giveaway with you. One of our lucky readers can win a set of the jewellery too. Pia are a jewellery company which have 16 shops in the UK and a retail website too. Pia jewellery offer a large selection of bracelets, earrings, necklaces, rings, brooches and more, using sterling silver, gold and gemstones including pearls, amethyst, turquoise and quartz. 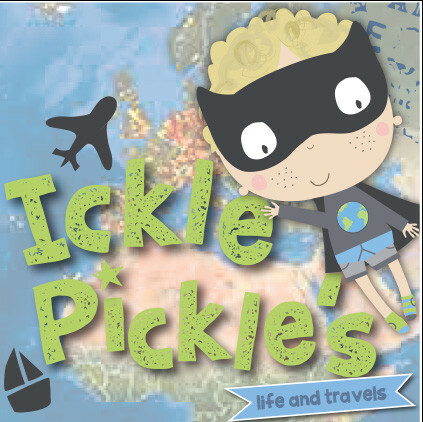 Pia offers worldwide delivery from £3.99, a next day delivery service and a 100% money back guarantee (except on pierced earrings for hygiene reasons). Pretty powerful stuff isn’t it? Mummy is a qualified, experienced Crystal Therapist who has worked with crystals for over 12 years. 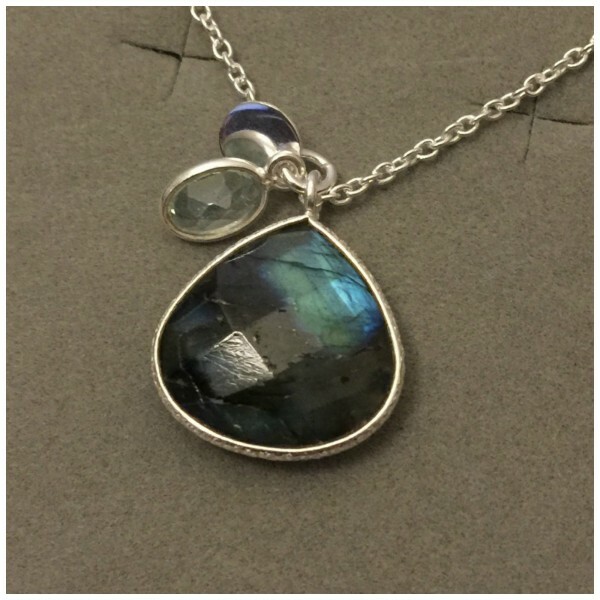 Labradorite is also known as the peacock stone due to the colours and flashes of electric blue, turquoise and green. It really is a beautiful stone. This set from Pia is set in sterling silver and comes with a 46cm silver chain. The pendant is 20mm. The stones are faceted, adding even more beauty. 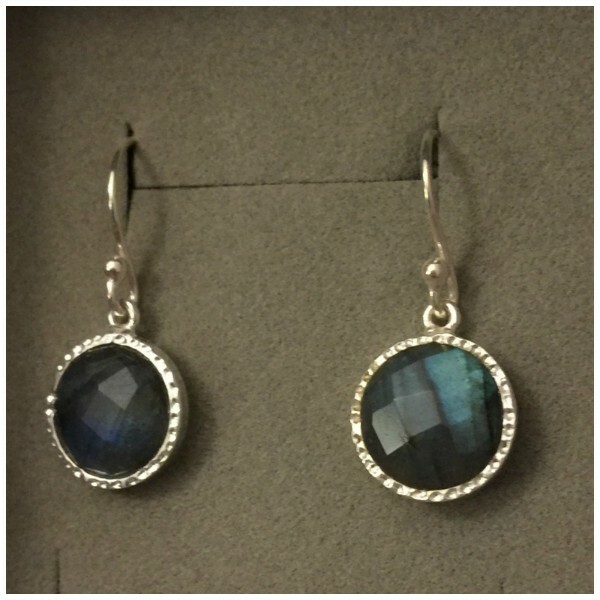 The earrings are set in sterling silver frames and are a 3cm drop. 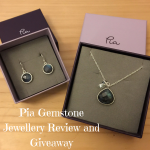 We just love Pia gemstone jewellery. It is lovely quality and great value for money. You will definitely find a piece of jewellery for yourself or a special gift for a special lady. I’d give it to my best friend, she deserves a treat & even with 2 boisterous boys threw me an amazing baby shower! It’s a gorgeous set – I would be really tempted to keep it for myself, but would probably give it to my sister! I think I would give it to my mum. But I also think my sister might like it so I don’t know if I’d have a fight to referee hehe! Not an earring can, but that necklace is lovely. 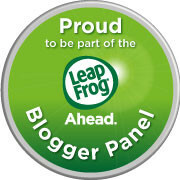 What a fab giveaway, good luck to all who enter! To my Mum, although I wouldn’t mind it for myself! I would gift it to my lovely mum. Can I be really honest and confess I’d keep it for me? I would gift it to my sister as she deserves a treat. 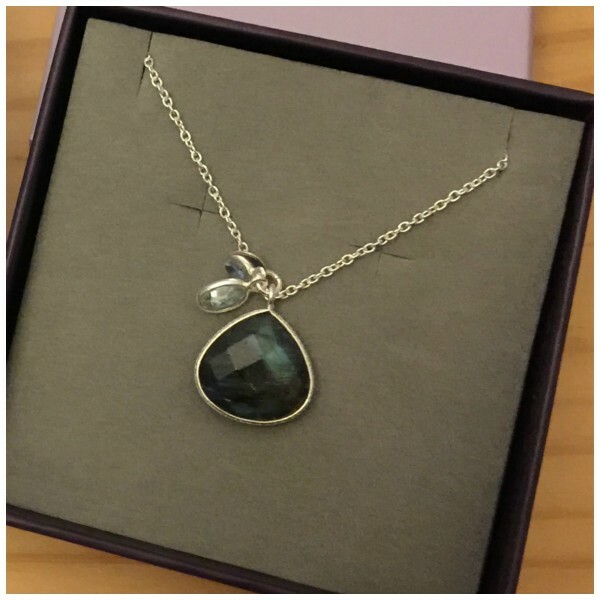 To my sister- she always has a knack of giving gorgeous jewellery as gifts. My mum would love this set x- Mothers Day is a way for me to celebrate the amazing woman that gave me life – she is so selfless all year round that it’s lovely to be able to pamper and look after her one day of the year – its a small way to repay everything that she does for me! Love the pendent. It is simple and elegant. My mum – she would love it. My sister she works so hard as her nurse and never puts herself first, it would be lovely to treat her. 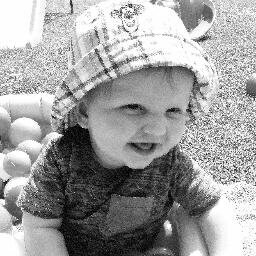 My best friend for being amazing! I would gift it to my eldest daughter, who has recently got engaged. My Dad would love it. But I’m sure he’ll insist I keep it for myself. If I won this I think I’d have to keep it for myself because I really like it. Thanks for the lovely giveaway. I wold treat both of my daughters–earrings to one and necklace to the other. I would save the set for my niece to have when she grows up. My daughter, I think she would love it. I have a friend who would really suit it and enjoy wearing it. I would keep this for myself, I don’t get many treats, as I am always buying the children things. I would give this to my Mum for a treat. My aunt who last autumn planted a load of bulbs in my garden and they have just popped up. my mum in law is always tricky to choose gifts for so this would make the perfect gift! I would give this to my best friend for her birthday in May. She has been working flat out at Uni to get her degree and she loves crystals so this would be a real treat for her. I would love to treat my mum. It’s her 50th Birthday soon and this would make such a special gift for her milestone birthday. I would give it to my daughter, Hannah. Not sure, but I would think about it carefully! It’s such a beautiful set I would want to keep it for myself! My cousin who has just had a baby, she is in need of a treat with all that lack of sleep. I’m not sure who I’d give it to. There are so many birthdays coming up. I would give it to my lovely daughter. It is perfect colours for her and I know that she would really appreciate it. I would probably give it to my daughter but would want to keep it myself. I would give it to my daughter who would love it I know. I’d keep the jewellery set myself. My mother-in-law, she’d love it. I’d give it to my daughter – she has been working incredibly hard and studying at the same time. She has a lovely silk dress this would go perfectly with. I would gift this to my dad to give my mum for their wedding anniversary. would love it for my girlfriend sarah. Definitely my Mum – hasn’t been very well for the last few weeks so it would cheer her up. Thanks for the chance, gorgeous prize. I’d give this set to my mum! It’s my best friends birthday in May and I know she would LOVE this, so I’d give it to her. I would give this gorgeous set to my lovely mum who has a very special birthday coming up at the end of May! My beautiful friend Maria to say thank you for being such an amazing friend and beautiful person. I’m afraid I would keep it for myself! It is my birthday in a couple of weeks and I can’t think of anything I would like more!